(ca. 1825, Vienna) from Glise's private collection. Since the late 1980’s Anthony has periodically taught at the Academie degli Studi “L’Ottocento” (Academy for the Study of 19th-Century Music) based in Vigevano, Italy. Because of his interest in historical instruments, through the years he has collected a number of extremely rare period instruments. Some are for sale and some have already been sold but his collection is so unique that we wanted to give you a chance to see several of these instruments. 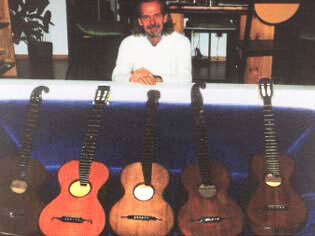 Anthony with several instruments from his collection of priceless 19th-Century guitars. Fischer (Gottlieb), Reisinger, Herzlieb, Stauffer and Reisinger. Anthony is now offering these rare and beautiful guitars for sale from his extensive private collection. Click on the names below for more information about these exquisite instruments.